Steve Levin discusses the reasons and methods for carrying out a search for extraterrestrial radio signals. 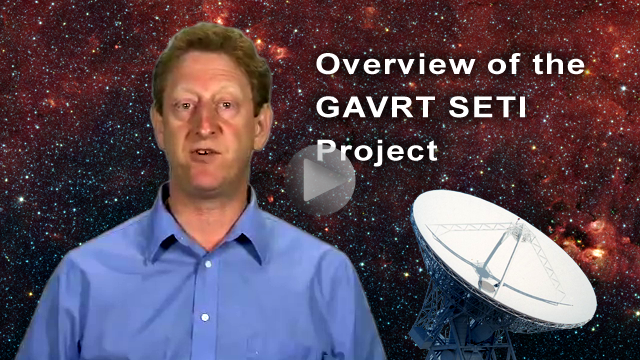 GAVRT/SETI uses waterfall plots which are not exactly a line graph, bar, pie, or pictograph. They are a graph that shows an x-y plot with the frequency of light plotted on the x-axis and time plotted on the y-axis. Data from the radio telescope scans are compiled into these graphs which in turn help us separate signals from interference. A real signal will only last for a short period, while the longer signal, which is interference, will always be there. The signals that may be of extraterrestrial origin will disappear when the radio telescope points in another direction. This lesson expands on the previous one, giving students examples of what to look for in waterfall plots and how to interpret or explain what is seen in the plot. What Are Our Chances of Discovering a Signal? Is there other intelligent life in the Universe or in our own Milky Way Galaxy? That is a question that has long caused us to look up at the stars and ponder if we are alone in the Universe. Considering all the stars that are sprinkled in the heavens above us, what are the possibilities of a signal from an intelligent civilization being discovered? What is the probability of finding such an indicator of intelligent life? This lesson helps students use probability to describe the chances of finding that one signal among billions of stars that would indicate the presence of intelligent life. What Wavelength of Light Do We Use to Search for an Extraterrestrial Signal? Light comes in wavelengths from radio waves to gamma-rays, all traveling at the speed of light but all with different energies or frequencies. If we are going to look for a signal from an extraterrestrial source, we'll need to look using light waves. Which wavelength of light to use has been a long debated question. This lesson guides students to discover the best wavelengths of light to use in their search for an extraterrestrial signal. How Do I Choose Which Part of Galactic Plane to Survey? Our SETI project will survey the entire galactic plane, but we can only cover a small part of it during each class session. To collect SETI data, you will first need to choose which part of the galactic plane to observe. As part of a science team, this decision is entirely up to you and your class. Scientists sometimes make this sort of decision by writing and reviewing proposals. In this lesson, your students will write proposals (either individually or as teams) and then they will decide which proposal is most convincing. This lesson introduces students to the steps in persuasive writing. The process will help the class choose which "skyframe" to observe and teach them how scientists communicate with their fellow investigators. As your students begin their scan, Dr. Levin has a few words of encouragement. "We won't know if there's life out there until we look for it, and today you could be the person who makes that discovery. Thanks for helping and good luck on your search!" In this lesson, your students will do real science using the tools used by real scientists. They may well discover a signal from outer space and in doing so, change the entire world around them.